DIY PROM Do It Yourself PROM chip burning help. No PROM begging. No PROMs for sale. No commercial exchange. Not a referral service. Hey guys. Really hoping someone can chime in here on what my plan of attack should be. I believe at this point that I've narrowed it down to the IAC parameters and calibration in the BIN. I'm running a 334 stroker with a 110LSA, 222/230 @ 050 cam. My old setup was a mega siamesed SLP runner setup. I got the tune not spotless, but damn close to it as far as idle quality goes. Then, my "I can never leave anything alone" syndrome struck and I sold the SLP setup, bought a superram, ported it and bolted it on. Now, I seem to be having some idle quality issues that I'm looking for advice on. I bolted everything up and fired up the engine running off the tune I perfected with the SLP setup. I really wasn't expecting to have to make any serious changes other than maybe some corrections to WOT fueling, but I immediately noticed a huge issue with the idle. With the correct IAC adjustment of 20ish steps, I was having an unstable idle. It would idle fine one minute, then the next it would start surging. You could watch the IAC steps, AFR and the SA swinging wildly around along with the RPM. There was a back and forth swing by as much as 1500RPM. It would do this for a few moments, then even back out, settle for a bit and then start surging again. BLMs were around 134, and then would drop once the surging started. I made a revised Low VE map with the fuel bumped up and a "Bowl" around the idle area with the fuel evened out in the 4 cells I determined the engine liked to idle at. Didn't seem to make as much of a change as I expected so I then decided to take the IAC out of the equation on a hunch. I adjusted the throttle stop screw to 0 steps at idle. All idle air was being pulled around the throttle blades at this point. It then idled BEAUTIFULLY without a single hiccup...Until the fans kicked on. It then started the same violent swing for a few seconds and would even back out until the next time the fans were commanded on which would in turn trigger the IAC to open. During one instance in about 20, the engine actually stalled when the fans turned on. There are no signs of a vacuum leak anywhere and other than the idle quality, she's running damn good. It's actually pulling MORE vacuum at idle than it did with the last setup (Went from around a 55kPa idle to 45kPa). Just trying to get this one detail ironed out. Also worth mentioning, this issue only seems to occur out of gear. If the transmission is placed in gear and the torque converter places a load on the engine (Shifting the fuel map into a higher kPa area), the idle is much more smooth and consistent. I am also not ruling out the possibility of a faulty IAC however, It's not terribly old and I purchased it about 30k miles back as a NOS ACDelco. What IAC Scalars/Tables should I pay attention to and what changes should I be making? So, I won't be able to flash it and do a test idle until after work today, but I was playing around in the BIN last night and made a few experimental changes. I am under the impression that the IAC needs to be "desensitized" a bit so it won't be so quick to make changes. - Adjusted "Idle bowl" in low VE fuel map. Once warm, engine favors idling in the 40 and 45kPa cells. Not 45 and 50 as previously thought. - Changed IAC Dead Band from 32.5 to 50. Any ideas on what else to play around with or if changes should be made to the minimum idle steps table? Last edited by FireDemonSiC; 02-11-2019 at 09:33 AM. Just the man I was hoping would comment. Thank you RBob. I'll let you know how it goes. Almost sounds like your battery terminals are a tad loose, or the alternator wire is loose. Were they disconnected during the intake swap by any chance? Battery was left hooked up to keep 2 way alarm functioning. Alternator was disconnected to prevent shorting the valve cover against the post. Everything was hooked back up and is tight. So when I got home last night, I checked and the "IAC - Volt Drop for Steps" Scalar was already set to 25. I spent the better part of the next hour experimenting with different things from the deadband to the idle steps table to the gain breakpoints. What I noticed was that the engine would do fine until it tried to settle to the commanded idle of 950RPM. You could watch the RPM drop and the IAC steps decrease, then right as it hit about 950RPM, it would suddenly "sag" to about 800 and start the surging process again though not as bad as before. I then changed the commanded out of gear idle to 1050RPM and it did flawless at this setting with 10-15 steps remaining on the IAC once settled. IN GEAR, it will idle fine at 900-950. Like I said, it is holding more vacuum with the new setup so I seriously doubt I have a vac leak. Any other ideas as to why it's behaving this way? Will post up datalog soon at an attempted 950rpm idle. Also, I am going by BLM AFTER the vehicle has entered closed loop. I've tired both open and closed loop idle (In open loop idle, AFR is around 13-13.5) and no change. Just to be clear, these issues I'm having are on a fully warmed up engine. Also, don't pay any mind to the fan on bumpstep deal. That was only an issue when I adjusted the throttle stop to where the IAC read 0 steps. Once out of gear idle was adjusted to 1050 and normal IAC operation restored, the engine does just fine when the fan kicks on with the "Fan On Bump Steps" set to 20. Sometimes the closed loop prop gains just driven everything crazy. I'm about to go out and fornicate with it some more. Will post up datalog shortly. Here are two datalogs enclosed into a ZIP file. The first is with a commanded idle of 1050 in CLOSED loop. I believe I even let it log long enough for the fan to turn on at the end. The second log, the ONLY two things that were changed were the idle was commanded at 950 and the option word flag was checked to force OPEN loop idle. The 1050 idle you will notice fluctuates ever so slightly but the IAC and idle control parameters keep it well balanced. Even when the fan turns on, it hardly misses a beat. Sounds healthy idling in the driveway on the 1050. I then turned it off, flashed the 950 BIN and started it right back up. You will see that from the very start, it's a total crap show and even triggers the stall saver. You can watch the WUD and watch the RPM/IAC steps begin to drop as it attempts to settle but then it goes totally haywire, surges like crazy, settles out for a moment and just keeps repeating the process over and over. Also keep in mind that this seems to be a problem only out of gear. In gear with the converter placing a load on the engine, it will idle at 900-950 no problem. Please tell me you guys see something I don't. I can't imagine any reason that this thing can't idle lower than 1050RPM. EDIT: I have also tried the 950 idle in closed loop as well. There is very little change, if any at all. Last edited by FireDemonSiC; 02-12-2019 at 07:35 PM. It's your commanded AFR. The 950-RPM bin is set to 13.0 in Open Loop when warmed up. Are you referring to the table, "Open Loop - AFR vs RPM & VAC"? 800rpm at 40-50kPa is set to 13.8. The next cell up is 1200RPM, also set to 13.8. I can't imagine how this is causing the issue epsecially since attempting a closed loop 950 RPM idle still does the same thing. What would you recommend trying? Won't hurt to press a few keys and watch the show. Great information. I was always led to believe the opposite. That due to the increased duration and overlap, the O2 is only measuring what's in the exhaust and not the chamber and therefore, more idle fuel was needed. So are you suggesting to try setting the 40-50kPa table at 800-1200RPM to a stoichiometric AFR of 14.7? Certainly won't hurt to try. Think of it this way; if you set your SA-Idle State advance to 24*, but your SA-Main Table was only averaging 10* because of the current location of the RPM & kPa, what do you think will happen? The very same thing, it will idle surge, but in your case it is the fueling that is skewed. Think about it, if you're running a VE that was tuned very closely in Closed Loop for a 14.7 idle AFR, but you suddenly set the Open Loop idle flag that is now targeting 13.0 AFR, the very same thing is going to happen. 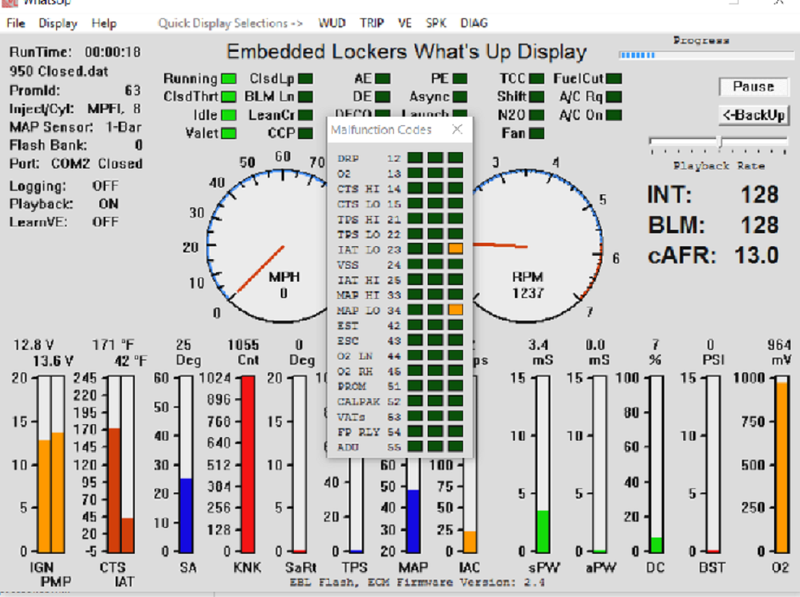 Remember that Open Loop has no O2 feedback, so how does it know that it is at 13.0 AFR? It doesn't. You're telling it based on the other parameters, and if your VE is already tuned for 14.7 at idle, but the OL is demanding 13.0, the difference is causing your surge. I get what you're saying. I will try more tinkering tomorrow and post up the results. Can't fire it up anymore tonight without the cops showing up. Also, I know you were just using it as an example but for the sake of eliminating any doubt and taking one more factor out of the equation, I have the "Idle State SA" Scalar enabled. It is set to 28*, and the spark table all around the idle area is also flattened out to 28*. Funny, I just recently had an encounter with the five-oh doing that very same thing. Was out tuning idle, time flew by, and it got pretty late. Explaining you were busy tuning usually doesn't fly very well with them. They were nice enough and gave me a stern warning. The commanded AFR is used in open loop fueling calcs, so if there's a large change in it from cell to cell ie 14.7--->13.0, it is going to affect fueling significantly regardless of how smooth the VE table is in those cells. FWIW my experience with idle tuning on my XFI280 383 is to ignore the wideband and narrow band 02s completely. When you have that much overlap (230/236), there's going to be fresh air going into the exhaust, skewing the sensor readings. My suggestion would be to set AFRs for the idle region to the same value, and keep it constant...for now. Use the multi-bank capability of the EBL and load several bins with consecutively higher idle SA values; all have the same VE. Pick the bin which produces the most vacuum, lowest MAP value. Drop the idle SA by a degree or two so the Idle SA correction can still pull the engine back up if it idles low. Once you have a good SA value, start leaning the sucker out at idle. Can do this easily with the multi-bank feature. Ignore the o2s and keep leaning it out until it starts surging. You'll know when this happens. Add more fuel until it stops surging and check the plugs. If they look good, then BAM! Idle fueling and spark is now dialed. Set your IAC steps again, and you're good to go. My wideband reports 17-18:1 at idle, and the narrowband rarely blips over 0mv. Normally, this would seem like an issue, but the motor has never idled better. I know I don't have any exhaust leaks. The readings are just a symptom of a lot of cam, and yours may be this way too. If your wideband is displaying 13:1, you may be much richer in the combustion chamber. Thanks for that. I'll definitely experiment around with that table tonight. And I just have an old man as one of my neighbors. You know how they can be. Usually starts complaining around 8PM but the noise ordinance in our county doesn't start until 10. Well, here's a couple more logs. These are both with a commanded 950RPM idle. The only difference is one log is open loop, and the other is closed loop. In this tune, I multiplied the entire AFR table from 1600RPM and below by 10% (Made leaner). This took the commanded AFR around the idle area from 13.8 to 15.2. In one last ditch effort NOT in either of these logs, I tried leaning it out even further to a commanded 16.8. I thought that would have made a considerable change, but it still idles and surges EXACTLY the same. Absolutely no change at all. It is still Idling fine on the 1050 BIN. Someone please tell me they see something amiss in these two logs. It simply refuses to idle at 950 out of gear. At this point, I'm stumped. Huh? It was plugged in. I just took the snorkel off and put it in the shed for the night. I specifically remember disconnecting it. I'm also looking at the EBL WUD right now and the last recorded reading from the IAT is showing 41F. What do you see? Interesting! I believe we could be onto the source of our problem! I recall when I first built this engine, It wouldn't run for more than 10 seconds before shutting off. I sent a log to RBob and he spotted the same thing. He explained to me that there are 3 stages of a code being triggered although I can't recall exactly what he said. But I dod remember I had to increase the "MAP Hi" limit for the MALF33 Scalar to 79 and that fixed the problem. However, this raises the question of exactly what is triggering these codes. The "MALF34 MAP Lo Limit" is set to 14kPa in the BIN and we can see it never drops that low in either log. Also, I cannot seem to find a parameter to adjust for Malfunction code 23. What gives? Also FWIW, my IAT has been relocated to the snorkel. and the 41F reading is accurate. Ambient temperature where I am is currently 35ish F.
Will try that. Tomorrow so the neighbors (Or Neighbor) don't go ape. And I agree with you on the malfunction code and the fueling issue. That would explain why the wideband was still reporting the same 13.0:1 AFR even with all the changes. Also, I do believe there is possibly a problem with the IAT sensor. I bought the V6 caged version from NAPA a couple years ago. On a few instances during some logs, I have observed it very briefly report an extreme negative value and then go back to normal. Someone else running the SuperRam had to do that to prevent idle surging. Isn't that telling the ECM to add/subtract 10* of advance with any deviation from the target idle? You're right, I goofed. Set it to 0° for the 0 RPM deviation. 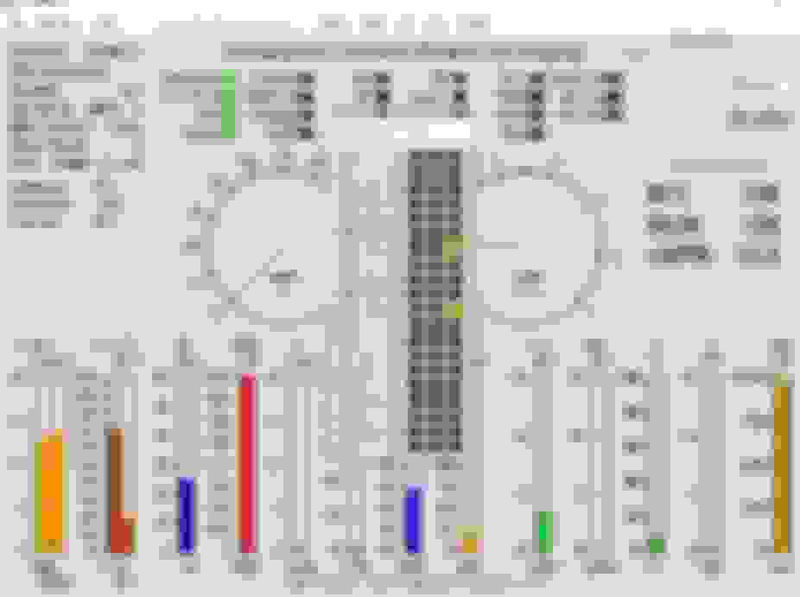 Then 5° at 50 RPM deviation. Then 10° from there on up. I have the zero cell set to 0* on the Idle high table, and 1* on the idle low table. All the rest of the cells are 3*ish. I may experiment around with it more once I get the IAT and fueling issue taken care of. Probably not an issue, but is there any reason you're running in valet mode? Anti-theft. Valet mode is set at 15mph and 3500rpm. Laptop was sitting on driver side T-Top and I didn't override it at that key-on. Shouldn't affect idle any that I know of. Alright guys. I admit defeat. I'm tired of chasing my tail. I tried literally everything. Adjusting IAC, adjusting spark advance (Bob, your idle Hi/Low compensation tip made a noticeable improvement BTW), leaning out the fuel and etc. All of these GREATLY improved the idle quality but I can't get it to idle below 1000 out of gear and 950 in gear without it going haywire. I THOUGHT I had it when I leaned the AFR out to a reported 16:1 and I THOUGHT I had it again when I reduced the idle advance a few degrees (It was at 28 resulting in a tug of war between the idle air and the spark advance. Reduced to 25) but, she just doesn't like it. Honestly, I'm OK with that idle though. It sounds aggressive (About as aggressive as can be for having an X-Pipe) and gives great idle amperage off the alt for all my gizmos. BTW, those two codes for the IAT and the MAP were from the other night when I forgot to put the snorkel on and started it up with a naked throttlebody. They were stored, but not active. The reason it stumped me at first was I thought flashing a new BIN clears the codes but I was mistaken. Usually what will happen is it will stall out the first attempt, and on the second attempt will idle high for a few moments then settle down. This morning however was particularly cold and it stalled out 3 times. I had to feather the gas pedal for a few seconds to keep it running and get it on its feet. IAC steps at key on, engine off are 153. What's going on here? It's as if it can't breathe. Last edited by FireDemonSiC; 02-16-2019 at 12:24 PM. There is no reason your engine can't idle smoothly at 800-RPM, and no reason why it should be stalling during a cold start. Which bin did you start with, and can you upload your current bin so I can see it? You could be right. The stalling on cold start however didn't start happening until this week attempting to correct the idle. When I first got the superram running it didn't behave this way. Have a look. This BIN is a very molested version of the F_3001 BIN (5.4L with 280 cam). That's the BIN I started with to get the engine running 4 years ago. Ignore high speed VE table. It's optimized for the old intake and the car hasn't left the driveway yet. What is your injector size and fuel pressure setting with vacuum line connected? The BPC value is high. I cannot remember the exact reason for setting it to 200 but I was told that they don't really matter as long as fuel is adjusted accordingly. BPC can be high with a lower VE or BPC can be low with a higher VE. I cannot tell you exactly what the fuel pressure is right now because I'm waiting for my 4an hose to be delivered so I can hook the gauge back up. But 50PSI with the vac line connected sounds about right. I turned the regulator down a couple notches the other night. It was higher. 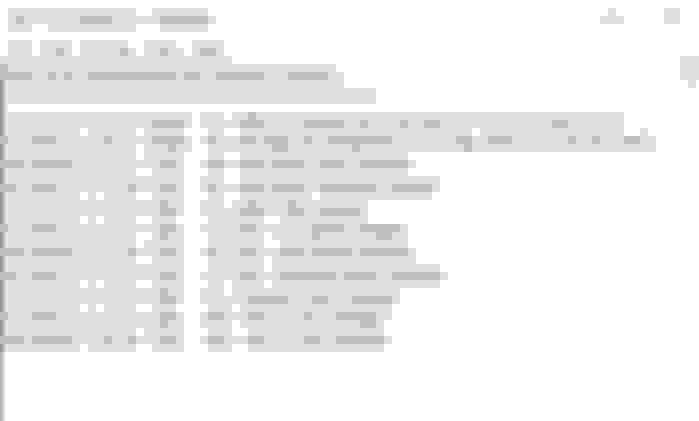 Also, I cannot comment on whether or not the BIN you uploaded works because the engine will not start with it loaded. It just sits there and cranks. Even tried opening the throttle a tad while cranking. See now that is what bothers me. The only parameters that were changed were based on your bin above, as I started with the F_3001 bin and changed the following, see below pic. The base/initial timing is yours, the ide state is yours, the VE is yours, and the Main SA is yours. The only thing I did was lower the target RPM in the IAC and adjust the BPC value. Strange that it won't even start. It might be the 3001 bin. Try starting with an L98 bin. Wouldn't it make more sense to tweak the IAC settings in the BIN I uploaded instead of starting all over again? ALOT of stuff was adjusted from the original 3001. .... and start the engine. The other stuff like timing and fan tweaks comes later. If that engine will not start with what I outlined above, then something else is wrong. You're running a 334 with good cam, and 22# injectors. It doesn't matter how good the intake flows, because its' the idle that you are trying to sort out, and the kPa is telling you what the vacuum is, it isn't a devastating amount (mine's at 65 kPa). Also, I think I know why it stalls on a cold start. I just remembered that I zerod the "Open loop - AFR Multiplier vs CTS" table because the previous AFR before we started all this and on the old intake would result in a fast, rich surge on a cold start. Once it gets going, it still surges until it hits roughly 95-100F on the CTS but this one is more of a lean surge. 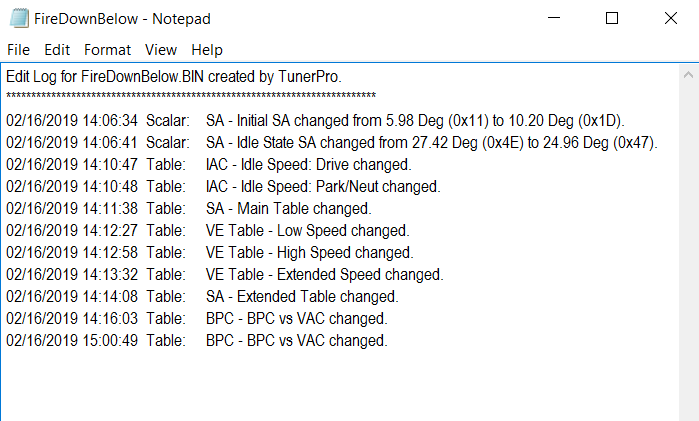 Why not use the "Copy from compare" feature of Tunerpro to copy all IAC settings from an L98 BIN into my current one? Last edited by Street Lethal; 02-16-2019 at 06:02 PM. Like I said I'm satisfied with the 1000/950 idle however just for S&Gs, I will try that tomorrow. Personally, I prefer the sound of an idle that turned up a bit and think the lowest I'd run would be 850. I want to allow the car to turn into an ice cube overnight and see how my current BIN does off a cold start with the AFR Multiplier table set back to normal. I will then try modifying an L98 BIN and seeing how that runs. Understand that whatever changes Bob made to that BIN have more than likely been replaced by me. When I first started on the tune for this thing, I sat down and spent the better part of 2 hours reading through the entire EBL_Calibration HTML file, getting familiar with what every parameter did (To my understanding, not alot of people do that) and making changes that I thought would be optimal for my setup along the way. Along the way of getting the engine running and the tune ironed out, there were several scalars and tables for spark advance and IAC settings that I copied directly from an L98 bin already.